Enjoy unlimited sunset views from this beautiful soundfront home, from the bridge to Manteo up to the open Sound. 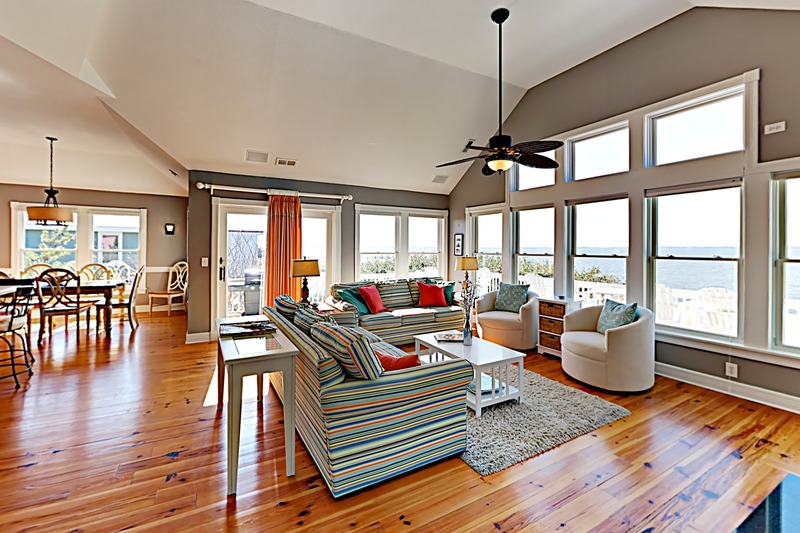 This elegant and spacious 5 bedroom, 4 and a half bathroom Nags Head home offers private retreats for everyone in your party, and a large and welcoming open floor plan (living, dining and kitchen) to gather for meals, games, music and entertainment, and amazing sunsets. Wake to a wide view of water— Tramonti offers dazzling views of the Sound from the wraparound sun, shade and screened decks, hot tub, living room, and most bedrooms. There is even a captain’s watch where you can step away a bit to use the desk, or send the kids up to play at the table for four. You and your guests will have access to the Village Beach Club amenities—beach, Olympic pool, kiddie pool, changing rooms, tennis courts, snack bar, and more. Golfers enjoy discounted rates at Nags Head Golf Links-- the “back yard” is the 15th hole. At Tramonti you are steps from the Village’s soundside park and the Village boat ramp, and from a shopping area with bakeries, an organic market, a diner, and more. The Village offers a shuttle bus (in season only) to help everyone get where they want to be. Plus, you’re only a short drive away from attractions like Jockey’s Ridge, The Lost Colony, Jennette’s Pier, local shopping, and so much more. Tramonti is the perfect combination of beach, sound, and sport— book a vacation you and your family and friends will never forget. Tramonti also offers Smart TVs, Wii, Kitchen Aid mixer and food processor and a Bluetooth stereo. Great stay in Flamingo Sunset! A beautiful home with incredible views. This home is amazing, thanks for a super stay in Nags Head.